For centuries dragons have been one of the most fascinating mythical creatures that a lot of kids love to talk about. Because of this, many toy companies have taken a huge interest in producing dragon toys in many different designs to capture the attention of young boys when looking for toys to buy. Due to the wide variety, it sometimes becomes difficult to know what type of toy dragon is best to play with. Therefore we have come up with this guide to help you choose the best ones available to buy and what cool actions they can do. As well as the different shapes and colored that dragons can be thought of, there are also many other interesting facts about them that we would like to make you aware of first. These facts will potentially make you understand the difference between the top range dragon toys and the low quality ones. In order to buy the best possible dragon toy for your kids, the factors below must be considers first. Otherwise the dragon may not appear as intimidating and attractive as all dragons are portrayed to be. Wings – These are really important to have on a dragon as they play a big part in distinguishing them from T-Rex dinosaurs. Teeth – A dragon without big sharp teeth loses a lot of its scariness and possibly its attraction to be played with. Horns – By having horns on a dragon, it gives them the unique scary looks that differentiates them from other lizard types of animals. Tail – All dragons are believed to have tails as this completes their scary looking forms. A dragon without a tail could possibly not be seen as a dragon. Limbs – Although you might find some dragons that are built similar to snakes, they usually all must have some types of hands and legs in order to differentiate them from actual snakes. Sounds – Many people understand that dragons don’t talk but can make loud roaring sounds as well as breathe fire. Toys that are able to make sounds become better for kids to interact with. Claws – All dragons have claws with long sharp nails because these allow it to be a fighting creature. Kids usually like to pretend fighting with dragon toys. Scales – The skin must look rough and scaly to help it look intimidating and ready for battling with other dragons. LEGO pieces are very popular toys that many kids love to play with. 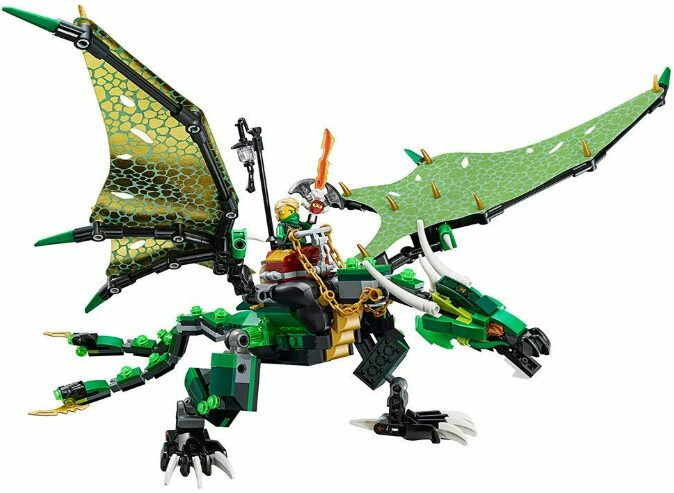 This version specifically is a piece that builds the Legendary Ninjago sky fighting Dragon. Once this kit is build, it includes a large 5 by 14 inch dragon with a wingspan of 22 inches when spread out and 8 inches when they’re folded. Apart from making roaring sounds, this dragon has all the necessary features that a dragon must have to be a fierce one. From its big white horns to a split tail, it can bring excitement to any child that plays with it. In addition to this dragon, this kit also comes with 5 mini play figures all of which have their own action gears and weapons equipped with. This ultimately creates a better playing imagination for your child. If this isn’t enough, it is always possible to mix this piece of Lego set with other ones in order to have a better imagination to the play. You may already be aware of this but just in case not, this Lego set can be quite complicated assemble, therefore it is ideally recommended for kids from the age of 8 years and older. 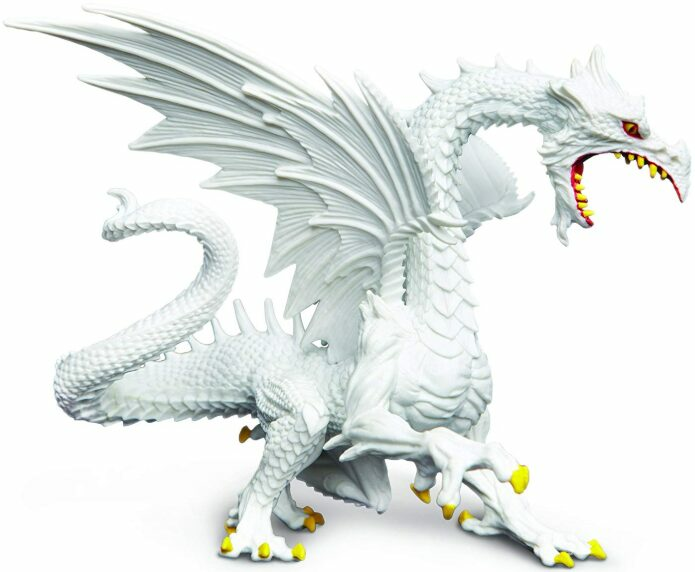 This glow in the dark dragon toy ticks all of the boxes to what a dragon must have in order to be seen as an attractive toy to play with by kids. However, Safari LTD aimed to make this not only a toy to play with, but also part of a collectibles set. There are many other types of dragon sets they make that you can also consider. Its main colors are white red and yellow and it is designed with luminous scales, sharp yellow teeth and big pointy wings. The look is so realistic that it is able to scare away any potential threat that approaches it. In daylight, this dragon is seen as an elegant white dragon but once the night time comes, it turns into a fierce looking green glowing dragon that can act as a lamp too. Measuring at just 5.4 inches long, 5.2 inches wide and 4.7 inches high, it can be safe to place on any dressing table top. Made from completely safe phthalate and lead free materials, means it is a tough one to break and your child is able to play with it for as long as they want. However, it is not recommended for kids younger than the age of 3 years. This exclusive dragon from the Dragon Ball universe is one to not miss out on due to its popularity. Any fan of the cartoon would be crazy about this toy whether to play with or just to place on a table and admire every once in a while. It is perfectly sculptured with the exact details of the actual dragon from the cartoon and which surely will capture the eye of any child. The face has the exact full red scary eyes with no pupils, flat top tree horns and the unique long whisker on each side of the nose. Shaped like a snake, this dragon is known not to have wings but has the perfect scaly back with small spikes running along the middle from head to toe. Just like a snake, the base of its body has smooth rectangular patterned blocks in a yellow color. However, just to differentiate it from a snake, it has 2 short visible arms and legs that give it a more fearsome look. This dragon is more of a collectibles piece and not such to be played with as it is build in a spiral type of shape that can’t be changed. It comes with a stand to keep it in place although it can be removed off the stand. Due to it being a unique collectibles piece of toy, it is one that is quite expensive in the market. Therefore it would be best to not be played with so often and recommended for kids above the age of 14. 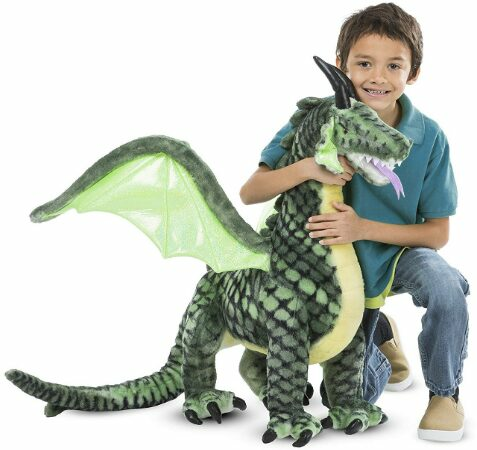 Build at an amazing 36 inches tall, 40.5 inches long and 16 inches wide, this toy dragon is able to bring excitement to any young boys face. It is designed to bring better role play to your childs games, although it is not intended to be a seat or a ride on toy. It is made from soft fabric and stuffed to make it plush and comfortable. The extra details added onto it are the glittery winds vinyl wings and horns to keep them up right. Also, green and black scaled, with sharp white teeth and a forked tongue to give it a scary look. The strong legs with black stable claws allow it to be stood up without any support. Does your kid ask you for a pet and do you think that they’re too young to have one? Well this life size stuffed dragon toy may not be as good as an actual live pet but can potentially keep them satisfied for a while longer as they grow up old enough to have a real pet. Not to worry about it being too big for a toddler as it only weighs 6 pound therefore it will not cause any harm and can be easily transported around. However, we do recommend your child to be at least 3 years old to play with this toy. Here we introduce to you Hydra the three-headed dragon or dinosaur costume for kids. Made from 100% polyester material, this costume is safe and comfortable for kids to play around in all day. It is a one piece jumpsuit made from warm plush fabric so they don’t have to be wearing much underneath to stay toasty. On the outside it is designed to make your child look like a fiery fearsome dragon with two extra heads as hands. Not only does this make them look scary but it keeps your child hands warm if the costume is used for trick or treating on Halloween. It come in a variety of sizes so they can best fit your toddler but ideally it is recommended for kids between the ages of 3 and 4 years old. This remote control dragon is one really exciting toy that kids would love to play with. It is only 28 cm tall but goes as long as 50 cm from head to tail which gives it enough space to have realistic looking features on it. It is designed with rough, scaly red and black skin with an angry looking horned face and a pointy tail. Unlike other remote control toys, this one has more than just the walking function built on its remote. The left button is able to make the head shake and the eyes light up to make to give it more realistic movements. Also, it can roar and flap its wings which will definitely keep the kids intrigued. The right button on the pad is the ones that controls the walking by one footstep at a time and can also make the eyes light up too. Not to worry about this toy being complicated as it comes already ready to move. However, the wings and the tail must be attached onto it first which is an easy process. It is made from safe rubber and non toxic ABAS plastic and requires 3 AA batteries inside the dragon as well as the remote in order to function (not included in the set). Although it is a pretty simple toy, it is still recommended to be used by kids from at least 3 years and above. A small plush cuddle toy is one that must be included on this list because all kids love to have a toy they can take with them everywhere they go. This one in particular is not stuffed with soft stuffing but is bean filled to feel squishier. It is 14 inches long and make with soft plush material on the outside to be good to play with anytime. 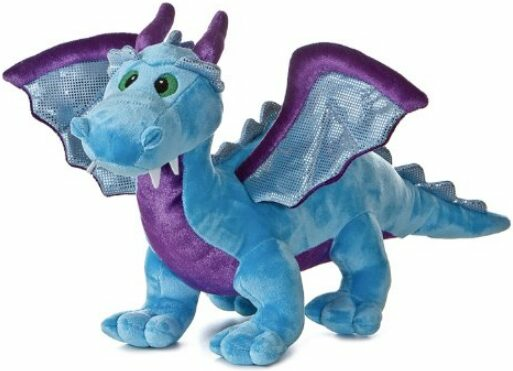 It comes in a light blue and purple color with glittery fixed position wings. Although it is just a child toy, it still has all of the features that a dragon needs to be identified as one. Because it is for young children, It is not built to look to look too scary but instead have a cute ‘play with me’ look. However, the manufacturer still recommends it to be played with kids from the age of 3 years. One last fact that you must be aware of is that once squeezed, it makes scary roaring noises that add more quality to it. Although this also may be an annoying feature to have if your child intends to cuddle up to this toy as they sleep. How to train your dragon is one of the most famous kids dragon movies to ever be released. This became ideal for toy manufacturers to make tiny play figures for kids to feel a part of the story. They come in a pack of 7 different styled dragons including the main one ‘Night Fury’. Although these small toys are great to play with, their main purpose is to act as collectible toys for fans of the movie. These small figurines all measure between 3 to 7 cm and are made from high quality PVC material to prevent them from being toxic for kids. However, it is best to supervise them at all times when playing with these toys because they can still be dangerous in other ways such as if they were to be consumed. It may come as no surprise to you to see that we have chosen the Lego dragon play set as the best overall toy to buy for your kids. This is mainly because of the endless potential fun that it is capable of bringing. By this we mean once your child begins to run out of imaginative ideas to play with the figures in this set, you can always buy them other set of Lego Toys to bring different play ideas into their heads. For example, there are many different Lego toys which include castles and fortresses which we would recommend you think about buying along with this set. On our list the dragon toy that is at the lower end of the price range and still has a lot of exciting features is the Remote Control Walk and Talk Dragon Toy. By this we mean that it doesn’t just offer one key function such as a ‘cuddle toy’ like some of the other cheaper ones on this list. Therefore you will be getting a lot more out of this toy for a reasonable price.